What’s not to love about this adorable one year old, long-haired, honey red colored, mini dachshund from North Carolina? Knox the Dox is Sadie Tripawd’s little brother. Together they are two peas in a pod and too cute for words. We think you’ll agree! Knox is an Internet sensation (you may have seen this picture of him in his PJ’s online – even Snoop Dogg shared it). So we pounced on the chance to chat more with Knox about his sense of style, his experiences to-date with fame and what it’s like being so darn good-looking. How did you find your home with Sadie? Since you’re such an avid reader, Any good books you’ve read lately? Where did your love of grocery shopping and skateboarding come about? When I was little my mom was teaching me tricks like sit, stay and lay down. My sister Sadie can skateboard, so I borrowed her Chihuahua-sized skateboard and hopped on. I was never afraid of it because I saw Sadie skating, so I learned pretty quick! One day I received an awesome surprise in the mail… Beggin Strips sent me my very own real skateboard! A friend of my mom’s had a tiny shopping cart that my mom thought would be cute as a prop for a picture. When she put the cart in front of me I jumped up on it and my mom realized she could teach me how to push it. The cart is too little for me now, but I still try to push it when I see it! What was your experience like at the World Dog Awards? The World Dog Awards was awesome! The entire trip to LA was awesome! I flew all the way there from North Carolina (and that was a long flight). The weather in LA was awesome! The best part was sharing a room at the Residence Inn Hotel in Beverly Hills with my best friends Turbo Roo & Ruby Roo. I got to see the beach and the ocean for the very first time while we were there (that was my favorite day, I love the sand!). 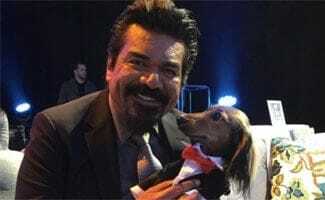 The World Dog Awards itself was a blast. We met a lot of famous people and famous dogs like myself. I even got to walk the green carpet and do interviews (I had my mom speak for me of course. I’m a little camera-shy). I got to meet the host of the show, George Lopez and was lucky enough to take a picture with him too! I look a little starstruck in my picture with him, but I was really just trying to figure out what type of “pawmade” he used for his hair because it looked and smelled great. I wasn’t up for an award this year, I was just a special guest, but I’m hoping to be nominated for an award next year! Everyone was so nice at the show and I looked fly as pup in my suit! Do you have pet insurance and if so which company do you use? We don’t have a pet insurance company right now, but we are looking! If anyone has any suggestions, I’m all ears! CanineJournal.com: Well, Knox, you’ve asked the right people. We spend a lot of time researching these companies so that we can provide the best, unbiased pet insurance recommendations to our readers. We have found it to be the best way to plan for the unexpected expenses associate with pet ownership in case of injury or illness. You have so many great outfits. Any tips for how to pull off a good look? Well, it’s hard to give advice on looking good when I’m all natural man candy. But I always stay well-groomed, pick outfits that are functional and look good and rock a style true to my personality! Hoodies are my favorite, FUR sure! 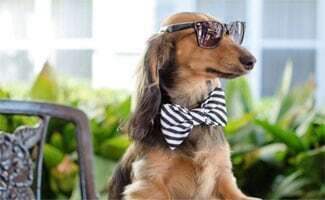 And let’s not forget, it’s all about lookin’ good for the ladies and ladies love a well dressed weenie! Besides your sister, who’s your favorite fellow celebrity dog? Turbo Roo is my dawg. He’s definitely my BFF, but I’ll admit I’m pretty obsessed with Ruby Roo, Turbo Roo’s little sister. We first met in St. Louis at the Pro Plan Incredible Dog Challenge and we hit it off. Then when we reunited in Los Angeles, we were pretty inseparable and played together the entire time! Also, she’s a total babe. What is your resolution for the year ahead? My New Year’s resolution is to keep trying to make people smile everyday! I hope to bring a little bit of happiness to everyone, especially the ladies. Oh, and to always say yes to all the glorious food the world has to offer! What’s your advice for other dachshunds? Always take the ramp, stairs are for dogs who have a lot less spine than us. 😉 And keep those big ears clean. You can hear the ladies calling a lot better when your ears are fresh! I’m single, I love to snuggle, watch Netflix and eat pizza. Call me ladies! What do you love most about Knox the Dog? 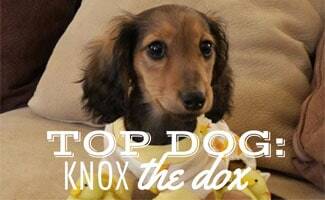 OMG Knox, you are too much! What an adorable dog and super fun reading this, what a fun series to interview these celebrity dogs, will check out some of the other Q&As, hopefully they are just as entertaining as this one!